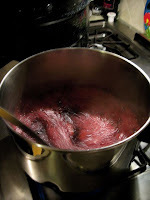 The Canning Doctor: Going "Off Script"
So I found a recipe for sangria jelly and added a few of my own touches. It smells awesome. It tastes awesome. I don't know what kind of shelf life it will have, but hopefully "long enough." 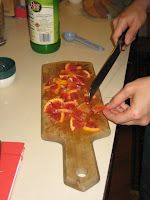 I brought everything but the pectin to a boil, added the pectin and boiled for 2 full minutes. 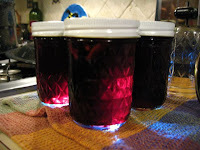 I processed the jam in 1/2-pint jars for 10 minutes and let them rest for 5 before removing them. It made 4 jars and a little bit more. Here's a shot of the finished product - a beautiful burgundy color. Looks tasty. Also, I notice that warnings on canning recipes are similar to warnings in knitting patterns, e.g., "For the love of God, don't twist the stitches when you join!" Death Jam! Woot! Bring on the extreme canning, I can take it!